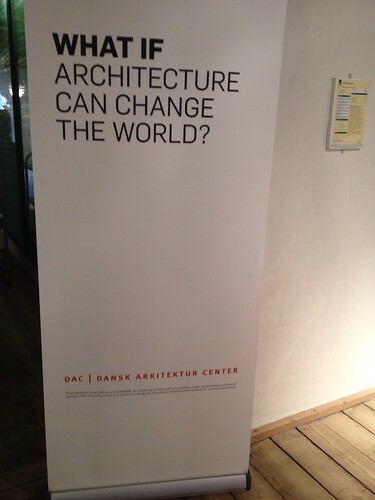 On Friday last week an interesting exhibition focusing on a cultural exchange of architects between the UK and Denmark opened at the Danish Architecture Centre in Copenhagen. The idea behind the project has been to look at how professionals from different places can benefit from collaborating. The main focus of the collaboration was cities and integration. You can also find more information on this important theme in project like Council of Europe’s Intercultural Cities project. In her opening words, the Danish Architecture Centres programme leader, Mathilde Serup, mentioned that one of the key objectives of the project had been to focus on how knowledge sharing can benefit the creative process. Subsequently, Jesper Pagh, editor at the Danish Archtectural Press, discussed the role of the architect and offered the suggestion that architects possess an ability to produce concrete visual pictures; pictures and visualisations which enable us to ask the right questions. As an example, Jesper mentioned the congestion charge which was recently proposed for Copenhagen. The proposal was forfeited, he felt, mainly because the wrong question were asked (around the cost-benefit of the solution) rather than a question around whether we would like a city-centre with fewer cars. Finally the rector of the Danish School of Architecture, Lene Dammand Lund, spoke passionately the possibilities of internationalisation that the project offers in terms of knowledge sharing and not having to start from scratch every time a new city needs to grapple with an issue. It is important to learn from other practitioners. She also mentioned the danger of travelling ideas akin to carbon copy culture discussed at Mission 2062 where ideas are mainly replicated from place to place without any foundation in the local context of the place where they are being used. The exhibition itself includes the sketch books and process diagrams of the 6 architects’ work in Copenhagen. It is a joy in this digital age to be able to hold the tangible outcomes of the creative process in your hand. Also there are video interviews with the six participating architects. You can find written interviews with some of the particiapants on the homepage of the Danish Architecture Centre. 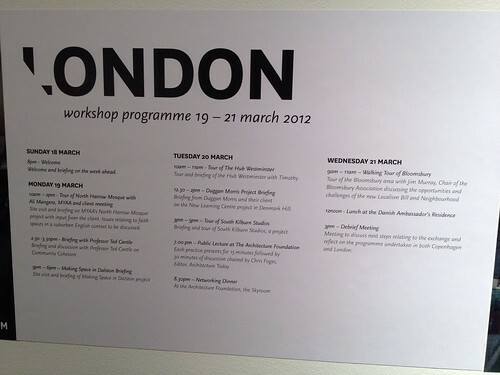 You may also want to peruse the inspirational programme which the Danish architects were offered when visiting London. This entry was posted in Cities and tagged creativity, UK. Bookmark the permalink.